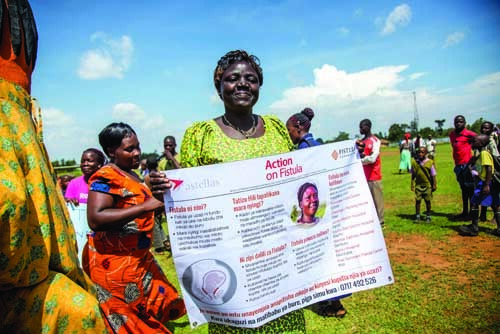 Action on Fistula, launched in May 2014, is an innovative partnership between Astellas Pharma EMEA Limited and the charity Fistula Foundation. Together, they set out to transform the lives of 1,200 women in Kenya living with obstetric fistula and to significantly build in-country capacity to deliver ongoing reconstructive surgeries by April 2017. Since launch, the campaign has been an unprecedented success, with over 2,300 women with fistula receiving life-changing reconstructive surgery and a doubling of capacity to conduct fistula surgeries in Kenya. A successful outreach programme is also running to reach and identify women for treatment. Astellas wanted to identify how best to create a corporate giving initiative which would leverage its expertise in urology and commitment to building access to medicines. Working with Forster Communications it ran a strategic review and identified obstetric fistula, a condition caused by prolonged obstructed labour, leading to faecal or urinary incontinence or both. While virtually eradicated in developed countries, there are an estimated two million untreated cases of obstetric fistula globally (WHO). Alongside physical suffering, women with fistula are often stigmatised because of constant and humiliating odour which in many cases drives their family, friends and neighbours away. The condition provided a clear opportunity for action, being an area of unmet need where few companies were involved and where Astellas could make a significant impact. It then located a geographical area to focus its efforts. Kenya was selected as fistula was a significant issue there, particularly in rural communities: the United Nations Population Fund (UNFPA) estimates 3,000 new cases of fistula occur annually. But, it also had sufficient infrastructure to run a programme; analysis identified that Kenya had existing hospitals with spare beds but a need for more trained fistula surgeons. To tackle this complex and difficult issue, Astellas chose to partner with Fistula Foundation, an international charity with a heritage of delivering campaigns in Kenya and a shared vision of addressing fistula through building in-country capacity to recognise, treat and eventually eradicate long-term suffering. Together they created Action on Fistula, not only to build capacity for treatment in Kenya, but also to run community outreach to find women and bring them in for treatment. The programme was developed to maximise use of existing hospital space by training more surgeons and create ambassadors to identify women in need in rural areas, and paying for their transportation and treatment, thereby changing the treatment landscape on an ongoing basis. Action on Fistula has transformed the landscape for fistula treatment in Kenya in enduring ways. It has given 2,363 women with obstetric fistula life-changing reconstructive surgery, surpassing the three -year target by an impressive 97%. One woman treated had waited a staggering 51 years for surgery. The programme has created a long-lasting legacy in the treatment of patients with obstetric fistula far beyond its three-year duration. It significantly increased surgical capacity in Kenya to treat the condition, by training six fistula surgeons to global competency standards set by the International Federation of Gynecology and Obstetrics. It also set up a Fistula Treatment Network to extend access to services, with seven treatment centres across Kenya providing fistula surgeries on a routine basis. With greater access to treatment, closer to where they live, women are no longer placed on waiting lists to receive surgery, nor are they forced to travel vast distances for treatment. The network of sites and surgeons work closely together, sharing information and resources, and creating a strong community of practice that will be sustained far beyond the duration of the Action on Fistula initiative. To ensure women living with fistula in rural communities can be identified and helped, Action on Fistula is running a major outreach programme, and training community workers to identify and encourage patients to access treatment. Through the programme, five local organisations have trained 222 community health workers, conducted 6,545 outreach activities and reached 412,000 community members in 43 of Kenya’s 47 counties. Formed partnerships with 15 media houses in Kenya that broadcast fistula messages on the radio, reaching across the country. The radio spots have included prerecorded public service announcements, as well as live talk shows where listeners can call in to get more information.